You've ran a lead generation campaign, gathered thousands of contacts that are interested in your product, organized your existing contact database and now... what are you going to do market to them? If a contact enters your database, only to receive an email newsletter once a month, you're promoting wrong. If a lead gets a few calls from your sales team, and then never gets an email later on, you're nurturing them wrong. If a customer purchases something from you, and then they never hear from you again, you're managing your flywheel wrong. Digital agencies leverage email marketing automation to do this legwork automatically, saving time and making your company look badass. There are more than a few ways to communicate with your leads and customers. Not every communication channel or message is right for everyone in your database. Marketing automation allows you to communicate to your specific groups in unique ways, and at unique times that depend on their situation and relationship with you. Email marketing automation is set up using a marketing automation software. You need to be able to create an email, set it to automated, and then trigger it to send based on certain criteria. You likely already have a CRM and an email marketing automation tool, or an all-in-one software that does both. Many email marketing companies prefer HubSpot, Mailchimp, Klaviyo, or Constant Contact. The type of software you have will determine your capabilities to execute, and to what degree of personalization you can get to. Use a platform that will allow you to trigger automated email sends without sacrificing the email's design. Before diving headfirst into an extensive email marketing automation strategy, take a step back and look at the way leads and customers are interacting with your digital environment. Where are leads primarily entering your system? How are you currently communicating with them? At what point do you try to convert them from a lead to a customer? How are you communicating with them AFTER they become a customer, to deliver a great customer experience and keep them coming back for more? Understand where your system is at, your weaknesses and improvement opportunities, and then decide what type of automation to build. Let's take a look at email marketing automation so that you can start maximizing your ROI on those contacts in your database. Enrollment Criteria: Contacts on a specific list, open to all email types. Send your emails at a time your contacts are most likely to open. Everyone manages their inbox differently and opens emails at a different time. Some of my coworkers are in the office at 6:30am to start their day, swiftly cracking open emails before I've had my first sip of coffee. Others like to work later, continuing to open emails once the hum of agency conversations silence for the day. 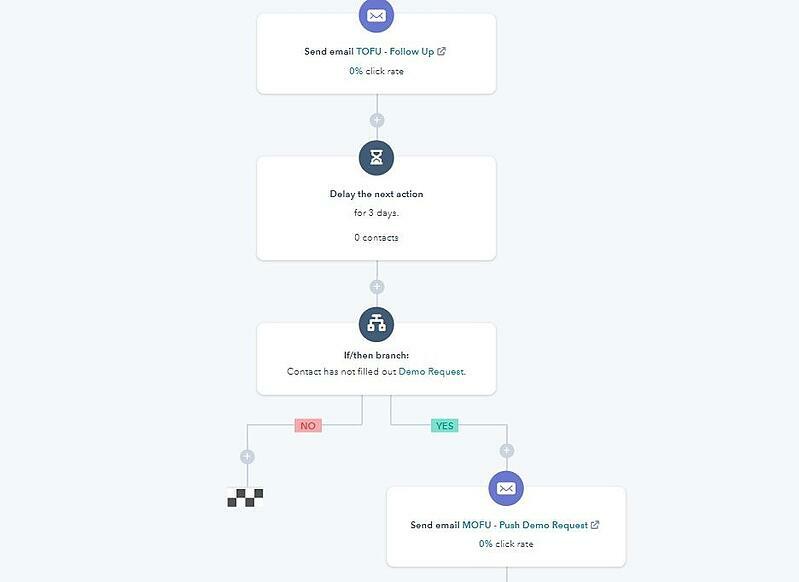 Send time automation automatically sends your emails at a time when that person is most likely to open and engage, based on their personal history of behavior. Using Seventh Sense, you can set up your emails to go out over a selected time period at the best possible time for each contact on your list. Extend your time period to 2-3 days when sending a not time sensitive promotional email, and Seventh Sense will send your email on the best day and time in that time frame. If you're sending out emails through a drip campaign, send your next email in the sequence at the best time within a 24 hour window. Every email becomes a living, breathing SMART email that drops into your customers' inbox right when that click-happy coffee buzz is hitting them. 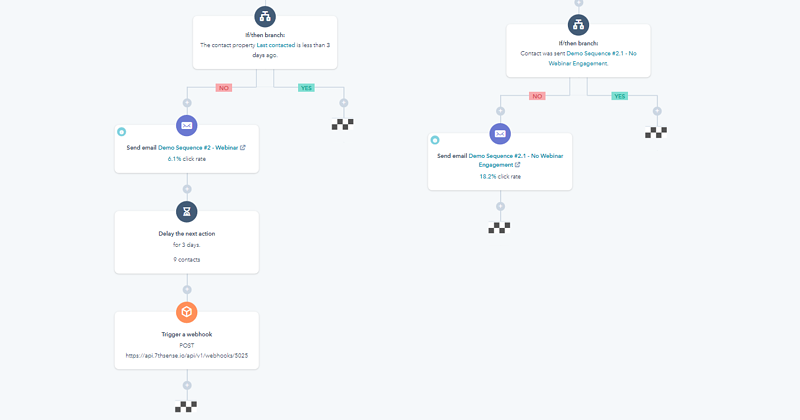 Using HubSpot workflows, add your delay between emails and trigger a Seventh Sense workflow that decides the right time to send the email. Drive attendance and set up sales with follow-ups. A major element of a successful event is clear and concise communication. In other words, give your registrants a foolproof way to actually attend the event they signed up for. Connect your event or webinar software to your marketing automation software to send confirmation details, add to calendar options, unique join links, hotel/parking information, and anything else that they may need. We suggest setting up beginning to end automated communications. Immediate confirmation after registering is key to making sure they can add to their calendar and receive details in a timely manner. Reminders that go out a few days before, the day of, and just before the event begins. After the event concludes, send any follow-up information (slides, video recording, etc.) to those that registered. This sets up the sales team for a follow-up sequence of emails to engage with your leads or a nurturing sequence to further them along before handing off to sales. Capitalize on user interest while you're top of mind. When a known contact is engaged on your site and poking around in curious places, it's your time to shine. Similar to a retargeting ad, you'll take a user's previously displayed interest and open it back up to them. Make yourself available instead of sitting in the backseat and waiting for them to come. You're fishing with bait that you know the user might be interested in biting off. Behavioral emails can be triggered from one action or a combination of actions, paired with your existing knowledge of the visitor. If you're an ecommerce store and a potential customer has visited a product collection page 3+ times and has never made a purchase, hit them with an email of best selling products within that category. If someone is a member of a tradeshow list, they've read a blog or two, and have been on your pricing page, use that information to trigger a simple email from your sales team and ask if they have any thoughts on how your product could work for them. Send product options based on what they're been browsing on the site. Encourage customer feedback and growth through outward communication and check-ins. As this McKinsey article states, "after purchasing a product or service, the consumer builds expectations based on experience to inform the next decision journey." The first 2 days after a customer has purchased is critical. They need to know that you're going to take care of their order, give them the right information to make the most of their purchase, and where to go if they have complaints or questions. Your welcome sequence should start by connecting the customer to any logistical information around their product or service they recently purchased. Next, thank them for their order and give them contact information on who to talk to if something is off. After that, give them the proper links to complete setting up their account with you, manage their preferences, and connect with your team. Depending on the product/service, follow up with them to leave a review and hear what they thought. Welcome new customers immediately after purchase, then follow up with them a few more times in the first week. Provide further information or nurture lead further down the funnel. Salespeople spend about 10% of their time in general sales follow up, according to this insidesales.com study. 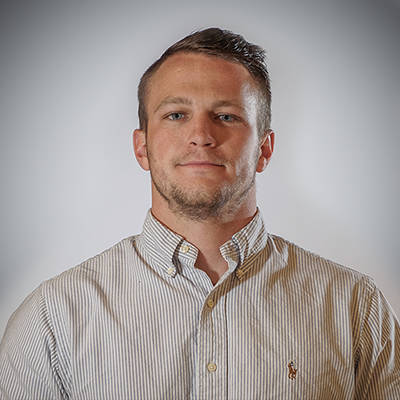 Marketing automation makes their job a little easier and improves efficiencies. Build out templates for your sales team to use that can easily be tweaked to be geared for your specific lead. With the goal of complete automation, set up the email to come from a specific salesperson and use custom language specific to how you were connected to the contact. You should always take into account the actions your salesperson is taking, and then build out how you can support the next steps in the conversation. Use meeting links and plain text emails to speed up and naturalize the flow. Convert your basic customer into a gold star customer. It costs five times as much to get a new customer than to keep your existing customers (invesp). Your existing customers can often be overlooked, but they should be highly valued. Keep them happy by making sure they can take full advantage of their plan with you and enhancing their own experience and business. Build criteria that allows you to recognize when you have an upsell opportunity. If you have a customer of your product from the last year, and it's coming up near the end of their terms, make sure they have been getting the right attention and know about all your offerings. If you offer a free trial, give them the opportunity to switch from a free-trial user to a paid user, and give them that option multiple times. Turn the conversion into multiple conversions. Different from the upsell, the cross-sell is the opportunity to sell something that compliments the original purchase. While they're exploring the product limitations and how they will use it, you have the customers' attention both pre- and post-purchase. To get the full experience out of a GoPro, you need accessories to use it with. Many products have a whole range of complementary products that they're simply unaware of. 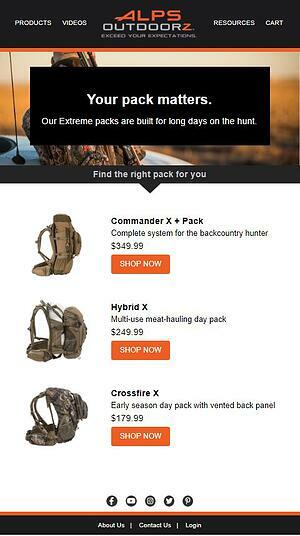 Trigger the cross-sell email based on the product. If your product is a best selling pocket knife, any time anyone purchases this knife they should also be aware of the knife sheath, belt attachment, and sharpener. Use knowledge of purchase information to exclude customers from seeing products they've already purchased. Make sure to send this email out in a reasonable time after purchase so it is applicable. Bring people back to the site to reengage with your content or your team. If you're an average company, only 2-3 of every 100 visitors to your site will convert (WordStream). Keep bringing these people back to your site by engaging with them and showing them the obvious path forward. They're not going to know the next steps to take with you if you don't guide them. After a first conversion, give ample access to your next tool and clear the path to talk to your expert team. Start by outlining your different funnels and conversion points. Map a low value conversion point (email subscription, pdf download) to a high value conversion point (live demo, ask the expert etc.) and plan your communications around that. The next conversion for them in your system needs to make sense, and your emails will be driving them forwards. Driving the next logical conversion for the contact. Give peace of mind and open up the conversation. A simple but effective way to give your customer peace of mind is to send a confirmation that you have received their request or submission. Similar to the webinar registration confirmations listed above, confirmation emails let the contact know that you have now have their information and set the expectation for when they will hear back from you. A job applicant will want to know that you have successfully received their info and when they will hear back. A paying customer expects you to give them confirmation so that there is no confusion at all on how much they paid and when they will hear from you. Set up your email to send upon the form submission in question. Include any necessary information, including a recap of what was submitted, next steps they can take in the meantime, and when they can expect to hear back. This primes them for future email conversations and shows that your company is organized and consistent. Give a final push to those that are close to purchasing. It's common and normal for an online shopper to add products to their cart, only to bounce and not follow through with the purchase. According to a SalesCycle report, as many as 75% of customers do this. Even if only a fraction of abandoners ever planned on making a purchase, over time this becomes a sizeable chunk of revenue lost. 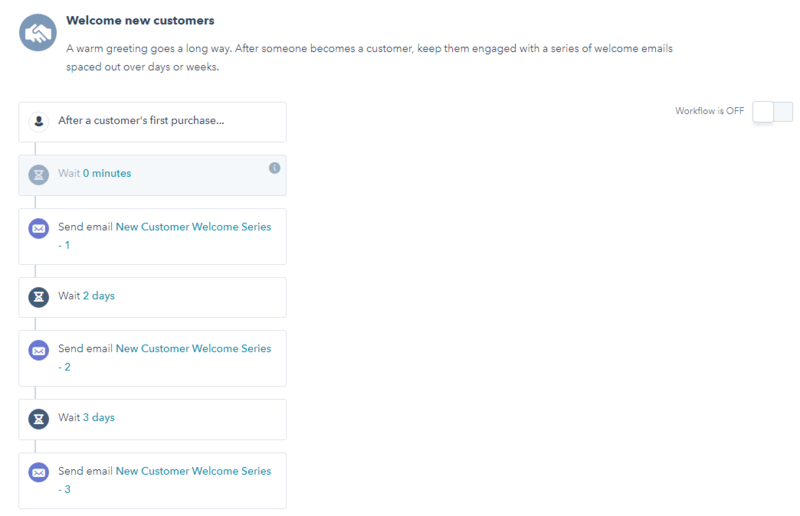 Set your enrollment criteria to identify when a cart has been abandoned, and then send the first abandoned cart email within the first day. 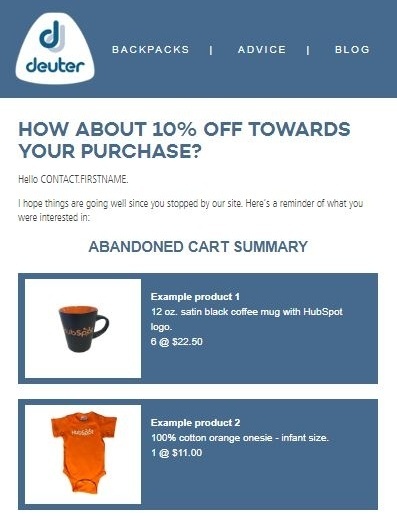 Abandoned cart emails should show the products that were abandoned and give a direct link back to the cart where the purchase can be completed. Set up two more emails to go out a 3-5 days after the first one and 7-10 days after the cart was abandoned. You can sweeten the deal with an added discount code of 10-20% if they need any more convincing to pull the trigger. Your email marketing strategy will evolve as your products and service offerings grow. Clear the path and simplify the next steps for your contacts and customers through your communications. Use automation to contact them at the right time and with the right message. A combination of ongoing promotional emails and automated communications, paired with an ever growing database, is a recipe for digital marketing success.